The standalone Skype videophone that Asus announced at CES is now available to buy in the UK. The Asus EEE Videphone is the first dedicated PC-free videophone, connecting over Wi-Fi (b/g) or Ethernet broadband links and powered by a rechargeable battery. The device has built-in microphone, speaker and VGA (0.3MP) webcam, with a 7-inch LCD display. There's also the option of a plug-in headset for private calls. "The Eee Videophone is Skype's first foray with a partner into the videophone category," said Manrique Brenes, Skype's director of business development. "With more than 25 per cent of Skype-to-Skype calls including video, we know that video calling is an easy, accessible and relevant way for people to communicate." However, the EEE Videphone (also known as the AiGuru SV1) weighs a hefty 1.6kg and offers just 20 minutes of talk time (or 30 minutes stand-by) on a single charge. With no keyboard, the Asus gadget doesn't support SMS or instant messaging, and you can't attach or open files. 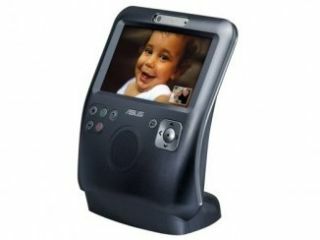 The Asus EEE Videophone is available now from Skype for around £220.